Montpelier – Let's Go RVing! After a great night’s sleep I woke up to sounds in the kitchen. The temperature had dropped again and it was in the upper 30’s so I hated to get out of my warm bed but was curious as to what was happening in the kitchen. Yes, my sweet husband was making a new batch of sausage balls. We have gotten in the habit of having sausage balls for breakfast and nothing else seems to tempt us – well, Pam’s Diner in Raleigh did one day! Since our only plan for the day was to visit Montpelier we took care of some housekeeping. While Jerry was baking sausage balls I was paying bills with intermittent Internet – yep, that is so frustrating but I finally got it done. We left about 11:00 for Montpelier located in Orange, Virginia. According to the GPS it is only about 20 miles from where we are staying but nearly an hour’s drive. We found out why it takes so long as we wound around the curvy roads. We are not in the mountains per se but we are definitely not in the flatlands either. 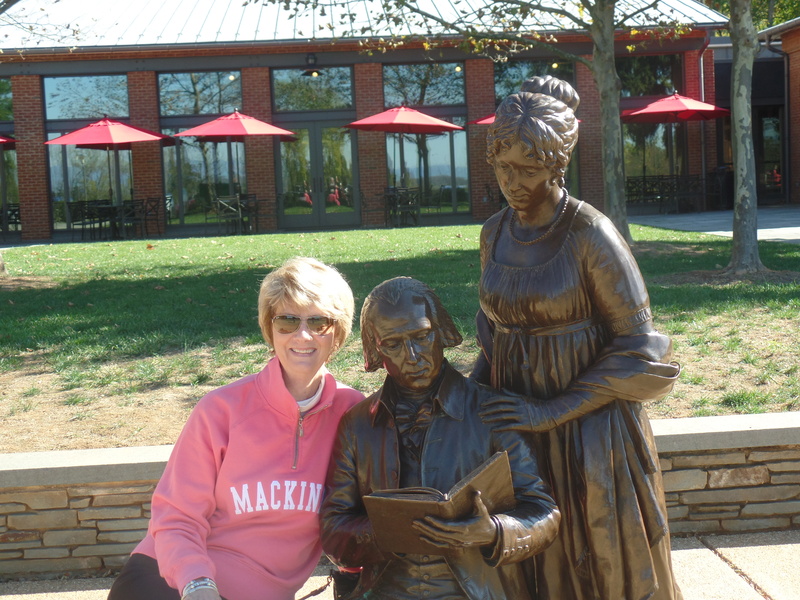 Visiting with President and Mrs Madison! Approaching James and Dollly Madson’s home affords an absolutely breathtaking view as it is situated at the top of a slight rise with an immense lawn in front. Later we finally got some pictures but it was difficult to get one without random people standing around as there was a constant flow. We arrived just in time to see the introductory film and then join the house tour. The film told of his life and his ascent to the presidency. He was quite a learned, well-read man and used it to his advantage. He was a believer in freedom for all – well except for the 129 slaves he kept and he believed in freedom to worship as one pleased. Known as the Father of the Constitution and the Architect of the Bill of Rights, the notes that he took during the early discussions of the formation of the Constitution became known as the Federalist Papers. James Madison appeared to be a quiet studious man who married a young widow with a two year son, Dolly Todd. Later known as the “First Lady” she was quite the entertainer. 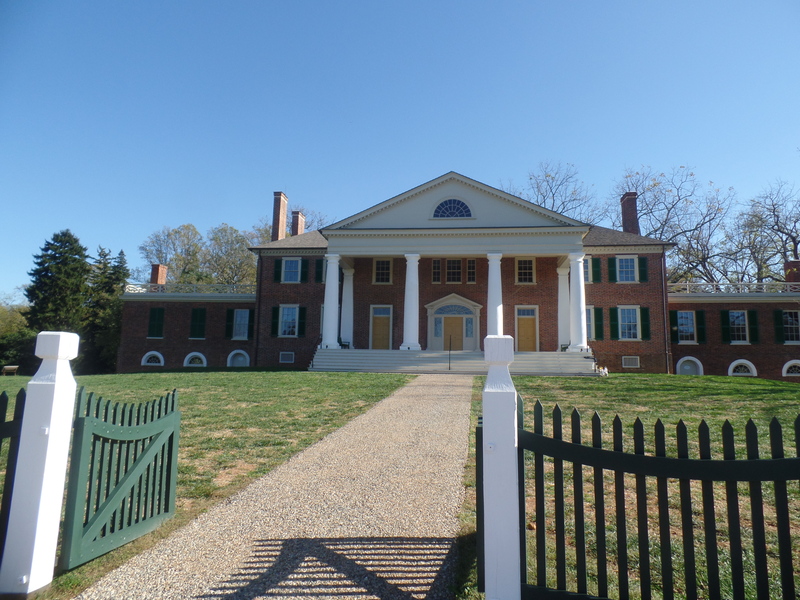 Not only did she constantly entertain during their 16 years in Washington, eight as Secretary of State and eight as President, when they returned to Montpelier she continued to entertain a constant stream of visitors in addition to helping Madison edit his papers. Unfortunately Dolly’s son seem to often end up in financial trouble as the years passed and he put Dolly in quite a financial bind. 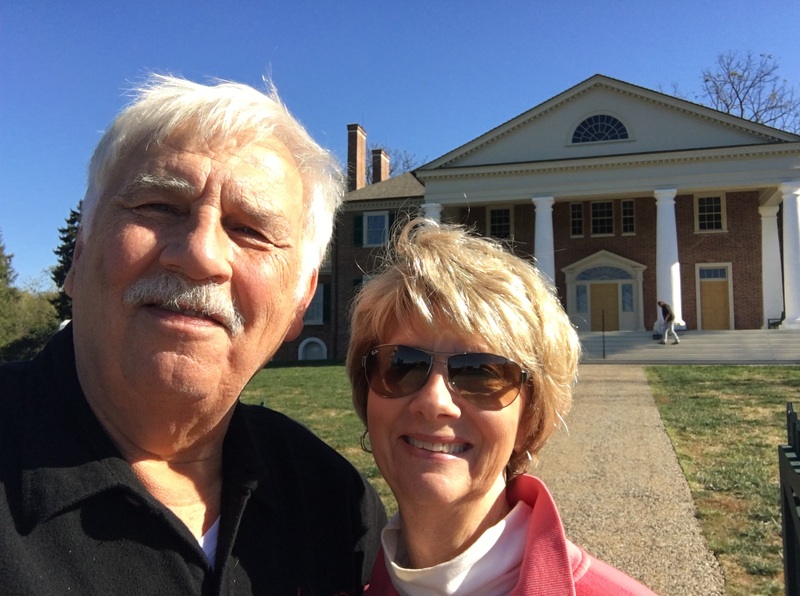 The home was sold and Dolly moved to Washington. The home was actually sold a couple of times and ended up in the DuPont family. They made several renovations and changes to the original house but when it was later donated in 2000 archeologists began the continuing process of returning the home and grounds to what it was when the Madisons lived there at the end of his presidency. The grounds are beautiful and we spent a fair amount of time walking around. A visit to their grave sites included the graves of other family members but most of the headstones were illegible. As we entered the estate I noticed a riding course and jumps so when we were in the Visitors’ Center I asked about that. According to the last DuPont owner her will stipulated that the Montpelier Hunt would be held every year during the first weekend of November and it is still in existence today. I asked about tickets and they are only $15 with $20 for a parking pass, rather reasonable. As we were leaving I asked Jerry which was his favorite, Mt. Vernon or Montpelier and he answered that if he were only going to visit one it would be Mt. Vernon simply because it was the home of our first president. Interestingly enough my original schedule called for a visit to Montpelier and if time provided a visit to Mt. Vernon as an extra. Glad it worked out as we have now seen the homes of four Virginia born presidents. The last two days we have heard a lot about government by the people, for the people, and of the people with representation. Wonder when it changed? When the media decided to slant the news instead of reporting the news that didn’t help. OK – off of my bandwagon now! On the way back to the campground we stopped at a Walmart in Gordonsville and picked up some groceries and then headed on in. When we walked into the RV it was warm so we opened a couple of windows and used the screen door. It didn’t take long for it to cool off. I’m loving this crisp fall weather! For dinner tonight I finally baked the other two pasties we got from Cousin Jenny’s in Traverse City, Michigan. I really like them and they are nice to have after a busy day of touring. A salad just completes the dinner for me. In closing, if you ever get a chance to visit Montpelier be sure to go. One young lady there with her two children said she had driven three hours just to visit Montpelier and I’m sure she felt it was well worth the time invested.